In my past 25 years as a Physical Therapist I have developed my best practice in hands-on/manual therapy in a one on one setting. I firmly believe that successful treatment of your injury or condition must be a team effort and requires educating you in the best system of self-management via exercises and techniques that will speed your recovery and prevent re-injury in the future. I enjoy working with motivated patients to help them reach their goals in returning to good physical health post-injury. 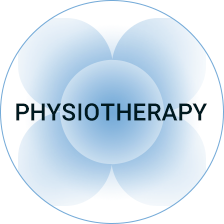 Since earning my Bachelor of Science in Physical Therapy with Distinction at the University of Alberta in 1993 I have had extensive training and experience in manual therapies as well as sport physiotherapy. I have been involved in the treatment of athletes from recreational to professional and Olympic levels. I have experience treating patients of all ages and with all types of injuries from neck and back injuries to sprains/strain/fractures and chronic conditions as well. I am most in my element spending time outside with my husband and 4 sons biking, hiking, camping and fishing or just hanging out on our acreage with our pets and friends. The element I most identify with is fire as it represents the energy needed for change as well as connection to inner strength that I believe every patient possesses and can use to positively impact their own health.